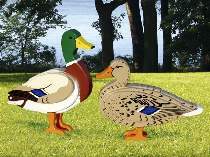 The most common of all ducks, Mallards are found in Europe, Asia and North America. They are remarkably adaptable to civilization and will breed in a city park if there is even a small pond. Plan includes FULL SIZE patterns for the male and female. Projects measure 15"L. Order two black rounds for eyes and one fiberglass mounting rod for each bird separately below.